Barring any unforeseen roadblocks that may get thrown up as the weeks tick down to the advent of cannabis legalization in Canada, the legislation now looks relatively bulletproof, having passed a tight vote in the Red Chamber at second reading. It’s been interesting watching the Conservatives make use of the Senate as a method of stalling or killing Liberal legislation passed by the House of Commons, considering this appointed ‘sober second look’ was long in the crosshairs of previous conservative incarnations for abolishment or extensive reform to prevent the very back-room shenanigans that are being witnessed today. Not only that, but the prospect of an appointed body stacked with failed political hacks like a public retirement home possibly defeating legislation passed by a lower house of elected officials — in essence appointees usurping the people’s will — still doesn’t go over well in many corners of this nation. Short of the slim possibility of defeat at third reading (and eventual proclamation), no matter what side one stands on the issue, legalization is now coming. What that is actually going to mean for millions of Canadians is still mostly guesswork at this point, but our jurisdiction has the benefit of being able peer over our borders at many now legalized U.S. states, as well as the example of other nations around the globe that have ended marijuana prohibition, like the Netherlands. One hopes some lessons have been taken away from these experiences, but by the end of 2018, we’ll be learning our own lessons the hard way. 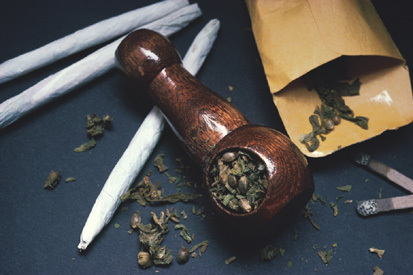 The debate surrounding the issue is still contentious, with some of those on the right suggesting the mountains are about to tumble to the sea, while chortling supporters — who often consider such pronouncements of doom to be wildly hilarious considering much of the actual evidence — often point to the hypocrisy that exists within our own society when considering the problem of drug prohibition. During a discussion at the most recent meeting of the Taber Municipal Police Commission in March about the presence of crystal methamphetamine — a substance well worthy of prohibition — making inroads into the community, Taber Police Service Chief Graham Abela expressed worry that changing public attitudes toward cannabis may be opening up a gateway for more damaging drug abuse. Which is perfectly fine, but only if you excuse the giant elephant that just poked his head into the room. The fact is, our governments have been saying “drugs are good” for a lot longer than the election of Justin Trudeau’s Liberal government in 2015. Most have been saying it since the 1920s. That’s when alcohol prohibition ended in most provinces. And alcohol, although sometimes we ignore its true nature — is in fact a perfectly legal drug from which governments gather millions in annual tax revenues. Now a wholly traditional and accepted substance in a huge percentage of Canadian homes, alcohol seems to enjoy a special privilege in Western societies as a mind-and-behaviour-altering substance used and abused liberally at all manner of social functions — just about any time, can be Miller Time in 2018. What is somewhat baffling, even shocking — is to peruse the statistics about impaired driving deaths, addictions problems, domestic abuse, violence — the entire rogue’s gallery of troubling impacts of alcohol abuse, and yet our society seems to be entirely complacent in brushing off these realities as the consequences of what is in essence a best- case scenario. Prohibition failed, we just have to accept that this is the way things are. But talk about potentially legalizing marijuana with this same group of people — especially if they were born, say, before 1950 — and the discussion immediately shifts gears into how legalization is poised to destroy the moral fabric of the nation and bring about a canni-holocaust among the country’s youth. Such well-worn rhetoric is more familiar than an old shoe to many from this generation, and it is illustrative of the power of propaganda that indoctrination of many of the false claims employed by government over the years has never really been washed clean, no matter how absurd. It doesn’t help that cannabis is invariably associated with the counter-culture revolution of the late 1960s and all the hippie visuals that go along with it — shiftless, unemployed, long-haired rebels trying to expand their minds at Woodstock hasn’t lent any romance to the issue over the years for button-down legislators lost in Ottawa’s bureaucratic fog of gray-flannel conformity. Not that alcohol is the only legal mind or mood altering substance that governments say is A-OK. If you want to get really technical, what about caffeine? Before you roll your eyes, it’s important to remember that caffeine is a stimulant and the world’s most widely consumed psychoactive drug. When we pound down three or four extra large coffees every morning, or allow children to consume multiple energy drinks, packed full of massive doses of caffeine, what is that message saying to our young people? The same could be said about nicotine, another legal stimulant. If our children watch us sucking down a few dozen coffin nails every day, how exactly do we convince them that what we do is OK, but if they do it, it isn’t? And what about mom’s secret addiction to prescription Valium or any number of other legally-prescribed substances that are a socially-acceptable addiction, while heroin and synthetic opioid addicts are often treated like third-class citizens, unworthy of society’s empathy? It’s likely that many people will be surprised by the numbers that might actually admit they use cannabis in a post-legal world, when it no longer needs to be a loosely-guarded secret that goes unspoken in many social situations, lest the long arm of Johnny Law casts his billy-club in your direction. It wasn’t indicated if these were trafficking files or simple possession beefs, but in the case of the latter, this begs its own moral question which, to be fair, should have been answered by Trudeau’s Liberals long before the legislation got this far. Who bears culpability for potentially saddling an individual with a criminal record for possession in the days and weeks before legalization is proclaimed? While law enforcement might take a shrugged-shoulders approach to this question, it’s probably fair to say the average citizen might not — especially if they’re the ones who end up on the business end of a charge for possession of a controlled substance. Hypocrisy has never been in short supply when it comes to what we decide is right, and what is wrong. Especially when it comes to drugs, it’s been largely arbitrary. While there should be prohibition for certain kinds of drugs — cocaine, heroin, you name it — show me the evidence that a substance like marijuana is causing profound harm to Canadian society, ripping up the foundations of Confederation, tearing asunder all vestiges of purity, or shattering the moral compass — and I’d be willing to sign on the dotted line for your War on Drugs. Unfortunately, most of what people see about cannabis is ossified propaganda from a bygone era desperately seeking fact, and that’s a very poor foundation to build your campaign on — in the past, in the present, and in the future.